I am still playing around with editing. 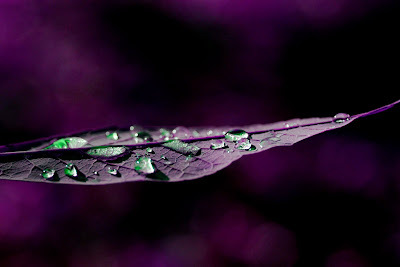 This is a picture of a leaf with some water droplets on it. I am sharing three of the same photo. Let me know what one you like best and the winner will be listed on Etsy and Artfire. So, post to comments your favorite. The winner will be decided Sunday at noon so you have until then to put in your vote. The one with the most votes will be listed in my Artfire Store, my Etsy Store and my 1000 Markets store. They are all lovely - but I like the original best! Diane, while they are all beautiful in their own right the blue toned is very striking. Great job. Wow, those are really good! I like the original best but your edits are really good. 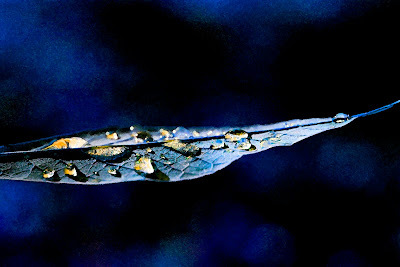 It is the contrast of the blue drops against the brown leaf that makes me like the original best. They're all lovely... but I'd choose the first one! Thanks everyone. So far the original gets 2 votes and the other two each get 1. I'll wait and Sunday post to Artfire and Etsy the one with the most votes at that time. ....my favorite is the original (the last one). I like the brownish leaf with the blue droplets...simple and beautiful!! I thought for sure that I had left a comment when I was here last I really need to make sure that it actually posts before moving on. I like them all but my favorite was the first, I love the purple and green together. LOL Ann. I will talley up votes end of day tomorrow then post the winner.